If you are interested in being a paid member or buying one of our awesome t-shirt, find our Finance directors (April and Jayden) at the meeting. Membership and a t-shirt is only $25. Membership only is $20 and a t-shirt only is $10. Remember to join our Facebook group! Love is in the air! Share a selfie with someone you appreciate and tell us why! YSD is almost here, Rotaract! Help us plan YSD everyTuesday leading up to the event on Feb. 24-25. Meetings will be held in Wellman 2 from 8-9 PM (after the general meeting)! If you have any questions, feel free to contact a co-chair or email us at [email protected].Winter Retreat Pictures!! 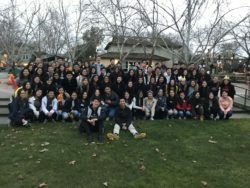 If you have any pictures or videos from Winter Retreat, please send it to [email protected] or message Claudia/Victoria. Take a break from studying and come hang out with us at Mandro. Boba, board game, and spending quality time with your favorite club members. It’s the perfect way to celebrate the incoming three days weekend. SUGGESTION BOX: Have suggestions or comments? Send them to us HERE. All responses are anonymous. This entry was posted in 2017-2018, Club Updates. Bookmark the permalink.